As a manufacturer of medical devices, it is your responsibility to be on top of the entire system that sees your product go from the idea stage to when it is available for users.A key part of that system is your suppliers. In fact, when it comes audit time you’ll be expected to show how you manage your suppliers and ensure that the parts you are supplied with are compliant with regulations and meet your specifications. I have been on both sides of the equation. I've worked at medical device companies purchasing parts from suppliers. I've worked at a contract manufacturer supplying parts to medical device companies. 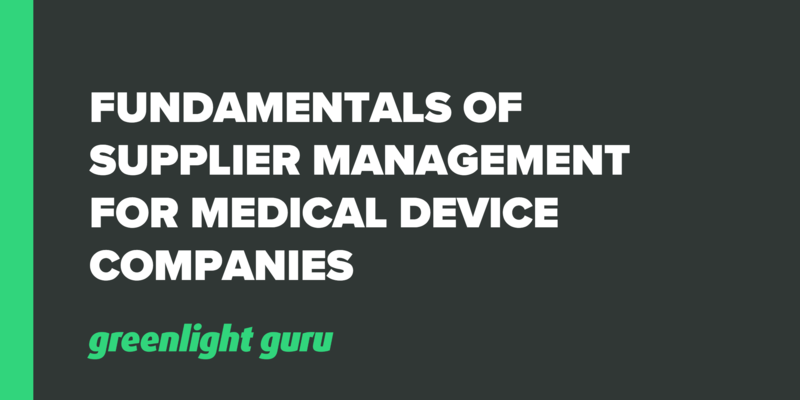 I would like to share with you some of the common issues medical device companies have and what you can do to better manage the supplier relationship. Free Bonus Checklist: Click Here to Download Our Free Checklist for Selecting Suppliers to Your Medical Device Company. Have you chosen the right supplier? A key issue that I have often encountered when auditing medical device companies is that people have chosen the wrong suppliers. Perhaps they were in a hurry and didn’t follow a good evaluation process. They go through the (often tedious) process of getting the supplier added to the approved supplier list, then discover issues afterwards. Sometimes it’s not apparent that there will be any kind of issues until you receive the parts from the supplier. Perhaps they had all the appearance of being able to deliver what you need, then you discover the part doesn’t meet your specifications, the finish isn’t what you were hoping for, or there will be problems with supply. The answer here is that you have to get the part in your hands to confirm that it will do what you need. It’s much better to discover that a supplier might not be a good fit before you’ve had them added to the approved supplier list. The forms and process for adding a supplier can be lengthy and difficult for them to complete, costing time for both of you, so you don’t want to go down that path without being certain. The follow-up problem is that when a supplier has already been added and turns out to be a poor fit, it’s often overlooked that they’re still on the approved list. What happens next? An engineer sees them on the list and orders more parts, especially if it hasn’t been well-communicated among team members about supplier issues. There’s often a tendency for companies to want to minimize the numbers on the approved supplier list - they’ll often instruct not to order from anyone else if there’s someone already on the list who can supply the needed part. This is why it’s important to a) choose the right supplier in the first place and b) immediately remove suppliers from the approved list who don’t turn out to be a good fit. There can be any number of issues with suppliers who are already approved, and they don’t necessarily come down to product quality. Sometimes it’s more the business side of the relationship, such as reconciliation for purchasing or even a lack of communication. Sometimes, it’s that your company hasn’t been timely with paying up supplier invoices and this has created a delay in orders. (Keep your suppliers paid up to preserve your relationships!). In either case, it’s important that you keep up clear communication with those in your team who need to know about supplier issues to try and minimize delays. When team members that are responsible for ordering do not know about issues, they’ll probably keep ordering then end up with a backlog. Don’t leave out supplier management when it comes to checks. Your quality department should be reviewing your supplier list regularly and determining whether everyone on it should still be there. This should be at least an annual evaluation. Investigate the product they supply and check that it is sent on time with no quality issues. As part of an FDA inspection or ISO audit, you’ll also be expected to be able to prove that the products they supply are made to regulation standards, so check as part of auditing that you have appropriate proof. They have reasonable customer response time. For example, when you request a quote or have a query, do they get back to you within 24 - 48 hours? They communicate about any problems quickly too. You don’t want unnecessary delays to production. Are they already on the approved list? If so, look for best value. This might be the cheapest, the fastest lead time, the best quality or any combination of these. Make your choice depending on your business need, for example, if you need the part yesterday and it doesn’t matter what it looks like, go for the one with the fastest lead time. Has someone else worked with them? Did someone you know refer them? Have you seen the part? You should always be looking for proof in the part first (often referred to as a "first article"), unless they have come highly recommended by someone you know and trust. Look for reviews online from other reputable sources if you don’t have a direct connection. Managing a supplier is really about building strong relationships. It’s like any situation in life - you tend to get better results when you’ve nurtured the relationship. The better you build trust and respect between your company and suppliers, the less likely you are to have issues. As with most things, communication is a huge factor; “communicate early and often.” You have to ensure that you let suppliers know as soon as possible about any issues and be very clear about your lead times, especially if there are any changes. For example, requesting an expedited quote or parts that you don’t really need that quickly. Suppliers know when you suddenly don’t get back to them that it wasn’t that urgent in the first place and you quickly lose credibility. Remember, suppliers will tend to go the extra mile for you if you’re good to work with. The medical device company / supplier relationship works both ways. If there are any issues with the part, make sure you talk to them first and do so quickly. It’s up to you if you need to issue a Supplier Corrective Action Request (SCAR), but it’s courtesy to talk with them first. The other thing here is to only issue the SCAR if it’s really necessary (such as for risk issues with safety and quality); otherwise, you may be going overboard. SCAR for suppliers is like CAPA for manufacturers, so understand that it’s a lot of work for them. That being said, realize a very important fact; you as the manufacturer are 100% responsible for everything to do with quality. Don’t hesitate to do the right thing where needed to protect safety and quality. Overall, you shouldn’t have many issues if you’ve been careful about supplier selection in the first place, but there is something else to be aware of; a lot of contract manufacturers won’t give you what they consider proprietary information (such as specific equipment settings or exact material formulations). However, you also have a regulatory obligation to have certain information available. You might not get all of the “secret sauce” out of the supplier, but you need confidence and confirmation that the part was made to requirements and specifications; for example, a certificate of compliance, or you go onsite in their facility, audit, and ask for a copy of the Device History Record for your records. Ask these questions upfront: “what information will you give me?” and, “what will you hold as proprietary?” Don’t go with the supplier if they’re not going to give you all that you need. Keep in mind that there is a very good likelihood that you will need this information and documented, objective evidence to demonstrate that the parts meet your specifications. This may be necessary to support regulatory submissions and clearances. Again, you are the manufacturer and are 100% responsible for quality of your devices. Doing appropriate research before adding them. Communicating early, clearly and often. Make sure the part meets your specifications before finalizing the supplier relationship. Building a relationship of trust and respect. The quality of your supplies and supplier relationships have a direct relationship with the outcomes for your medical device. Make sure that this is an area of your business that you audit regularly and keep good records for in your QMS.